DACA UPDATE: USCIS is not accepting requests from individuals who have never before been granted deferred action under DACA. 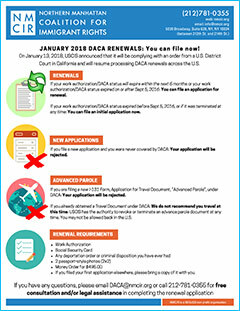 Due to federal court orders on Jan. 9, 2018 and Feb. 13, 2018, USCIS has resumed accepting requests to renew a grant of deferred action under DACA. The scope of the Feb. 13 preliminary injunction issued in the Eastern District of New York is the same as the Jan. 9 preliminary injunction issued in the Northern District of California. Unless otherwise provided in this guidance, the DACA policy will be operated on the terms in place before it was rescinded on Sept. 5, 2017, until further notice. Updates from United States Citizen and Immigrant Services, 2018. If you have immigration related questions such as questions about legal screenings for other legal options, there are resources available at John Jay, CUNY, and from many nonprofit organizations that provide free or low cost, high-quality and confidential immigration law services. Please click here to access additional information. Please also beware of fraudulent and deceptive practices by persons posing to be lawyers, such as those claiming to be “notarios.” When in doubt about a person or organization's legitimacy, check with a knowledgeable and reputable source, such as ones on this site, before you proceed. On January 13, 2018, USCIS announced that it will be complying with an order from a U.S. District Courtin California and will resume processing DACA renewals across the U.S. Read more about DACA renewals.